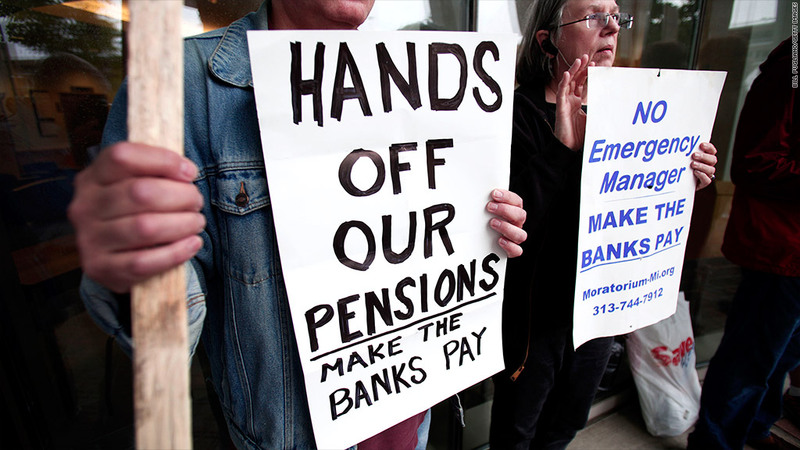 Investigations of Detroit's two pension funds likely to show that decades of overpayments to retirees and active employees drained about $2 billion from city coffers. Detroit's financial watchdogs will continue investigating policies at the city's pension funds that likely cost the city billions, according to a report released Thursday. The city said an initial investigation revealed "questionable practices" and that further examination would be needed. The practices include excessive reliance on risky real estate investments and a policy that rewarded pension recipients with bonus payments. The report also outlined possible problems with how the city handled employee health care and other benefits, noting that the investigation uncovered that 13% of city unemployment claims reviewed were likely fraudulent. In June, roughly a month before Detroit's historic bankruptcy filing, state-appointed Emergency Manager Kevyn Orr called for the city's inspector general and auditor to examine "possible waste, abuse, fraud and corruption" at the two funds, one for police and firefighters and the other for general city workers. "The purpose of the audit is to help identify how the city can address its present financial crisis and going forward help determine the basis for and what, if any, actions that must be taken," Orr said in a statement. In a joint statement, the pension funds said they "are currently operating well within industry standards," and will continue to cooperate with the auditors' investigation. Although the report did not go into detail about the questionable practices, the bonus payments were previously criticized in the city's bankruptcy filings. According to city records, officials who oversaw the city's general pension fund regularly approved extra payments for current and retired employees in addition to the promised pension benefits, based on the belief that the funds could be more generous when their investments generated positive returns. A report given to the City Council two years ago showed that the general fund's overpayments cost the city at least $1.9 billion from 1987 through 2008. It's unclear how common (or costly) extra payments were at the police and fire fund. The practice was eventually stopped by the City Council in 2011. But one of the city's unions has argued it was halted incorrectly and should be reinstated, according to a motion filed with the bankruptcy court this week. This week, Orr ordered city officials to turn over records related to bonus payments by both pension funds, which will likely be used as part of the further investigation. Orr has previously said the funds have a $3.5 billion financial shortfall that makes benefits cuts for both current workers and retirees inevitable. The trustees who control the funds are opposing the city's bankruptcy filing and have countered that the funding situation is far less dire than Orr indicates. He is also proposing to freeze any future pension benefits for current workers and would instead shift those workers to a 401(k)-style plan for future benefits.